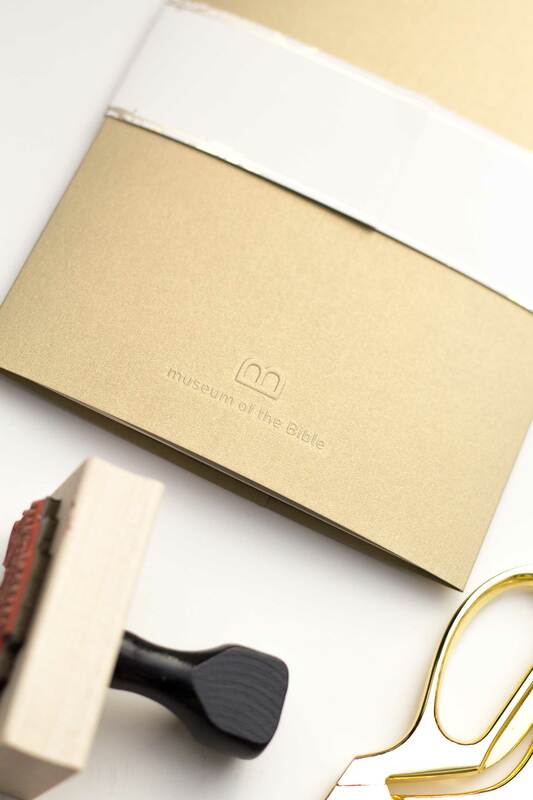 I’m so thrilled to finally unveil the branding and design for the Museum of the Bible Opening Events. There were four events total—two of them black-tie galas. 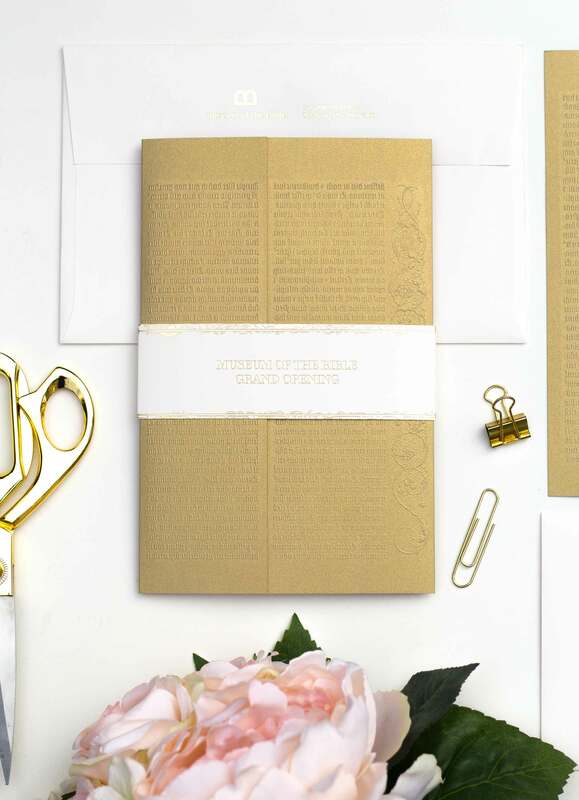 The carrier for the invitations mimic the bronze front doors of the museum itself. The doors are embossed with the actual first letterpress impression of Genesis in the Gutenberg Bible—significant because this Bible was printed on the first moveable type printing press invented by Johann Gutenberg which made it possible for the masses to read the word of God. 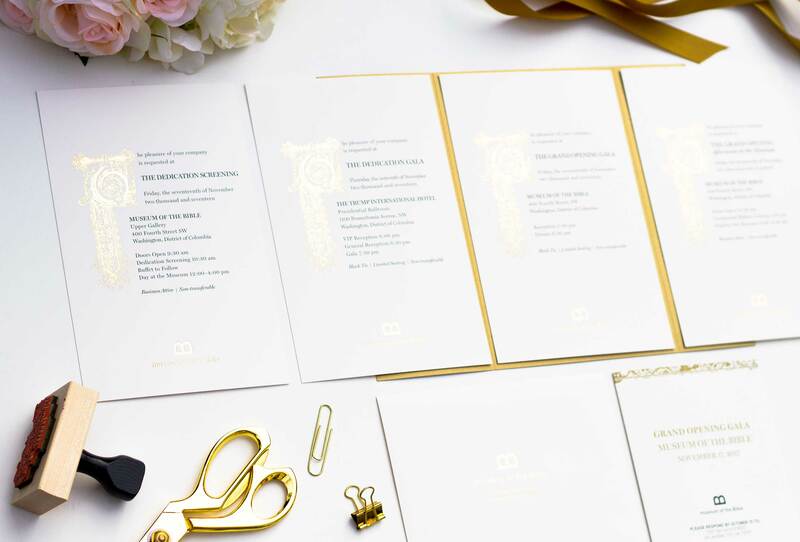 The carriers were kept closed with a cream belly band stamped with gold foil and the scrollwork from the doors were added to adorn the bands and add some interest to the borders. Common for Bibles of that era was illumination added by hand. 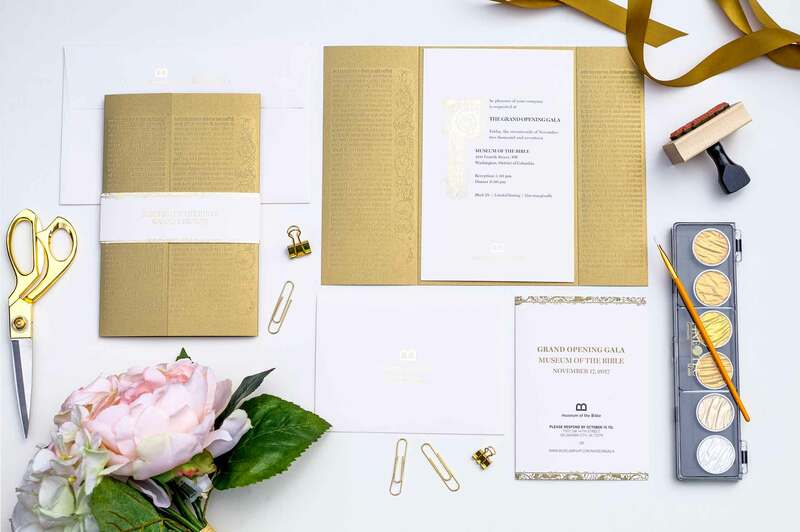 In keeping with this tradition, I researched and found actual illuminated letters of the 15th century and used it as the basis of the design for the invitations. 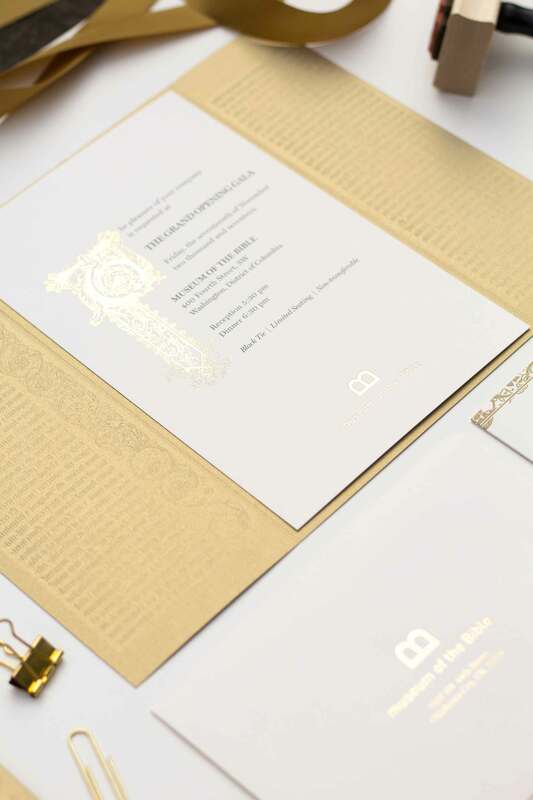 Not everyone was invited to every event but the client wanted the illuminated letter—and the museum’s logo—to appear on each event invitation. 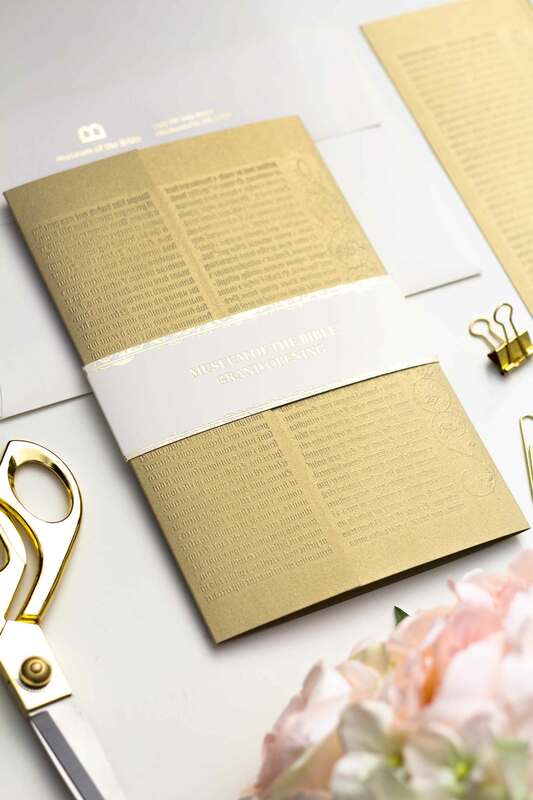 As a result, I had 5,000 illuminated letters foil stamped in the same location and only the text changed per event, helping to keep costs down. The response cards were pretty extensive with sponsorship levels and hotel information. 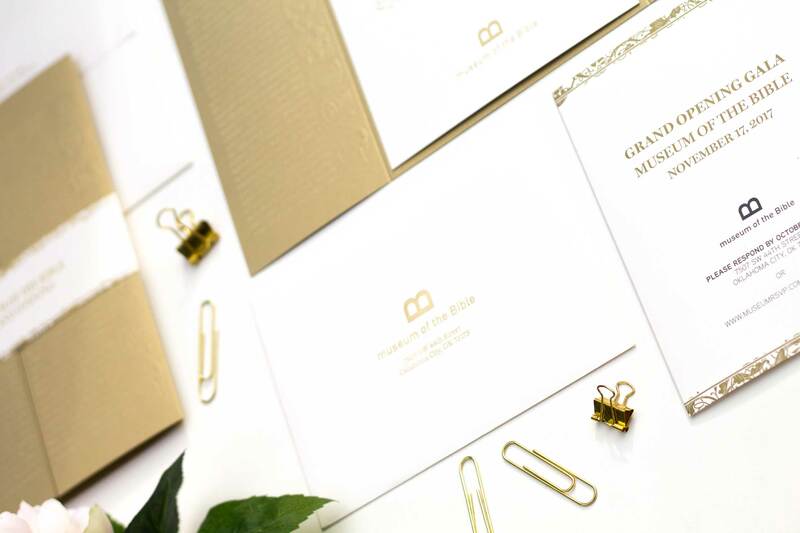 They were offset printed with gold and black ink and were paired with foil stamped response card envelopes. Leaving no stone unturned, I added the Museum of the Bible logo on the back of the carrier, adding a little interest to every surface. Finally, I designed the credentials badge for each event using the museum as the backdrop. 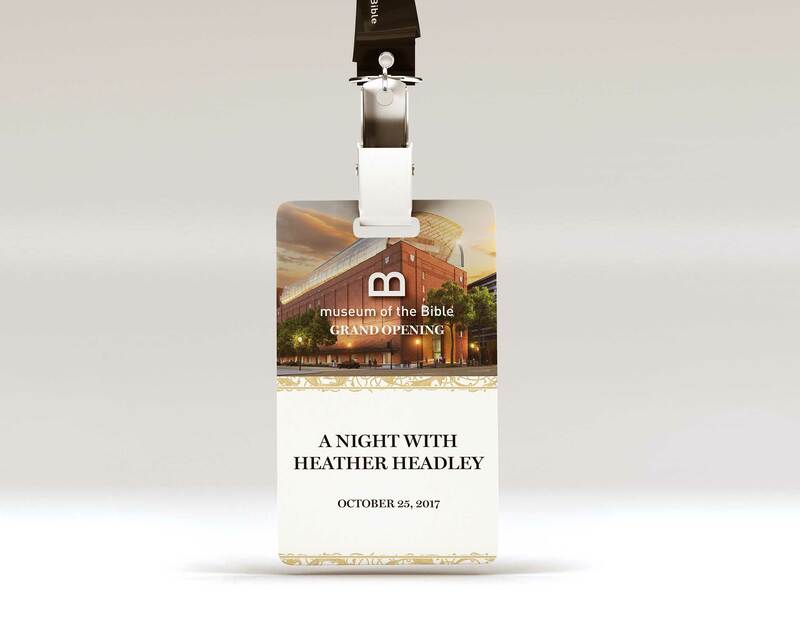 The scrollwork added some visual interest but also providing a way to quickly designate VIPs.